Boo! Looking for Halloween table decorations even the Adam’s family would love? I’ve got you covered. Shh.. be careful where you sit and watch for monsters! Hello, and welcome to my non-traditional Halloween tablespace! 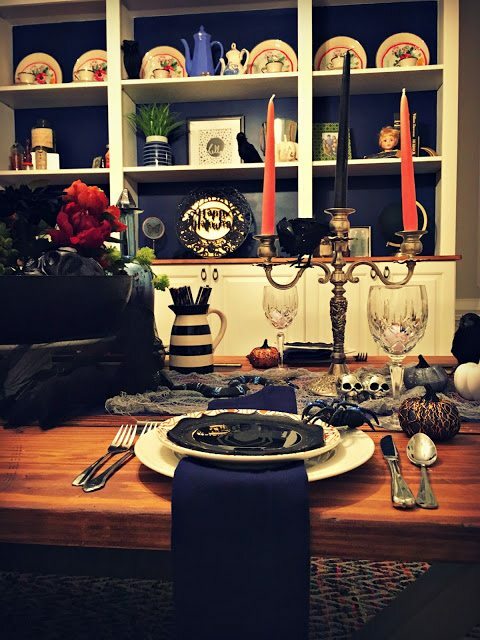 I’m so excited to share my less than traditional Halloween table setting with you and hope you’ll find oodles of Halloween table decorating ideas during your visit. 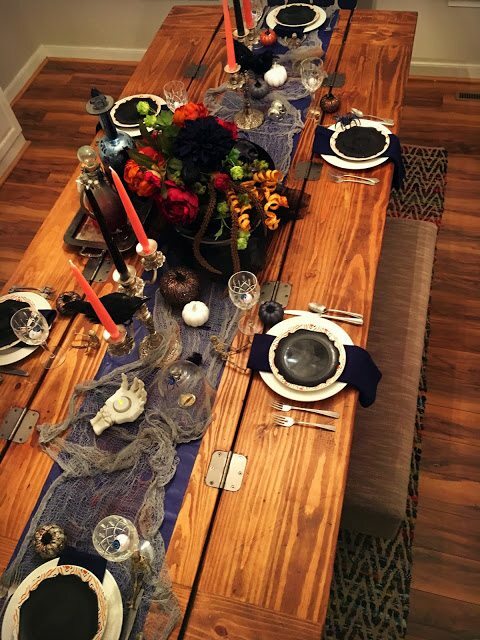 Many thanks to Chloe of Celebrate & Decorate for hostessing this lovely tablescape hop. 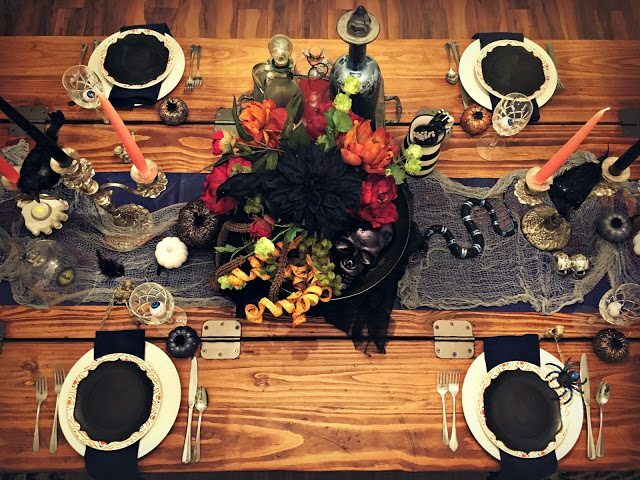 She’s gathered 27 tablescapes that are sure to give you Autumn ideas and inspiration. Be sure to check out the remainder of the tablescapes at the bottom! If you’re coming over from one of the other fantastic blogs in this hop, it’s so great to meet you! My small family of seven (ha!) moved into this house about nine years ago. The first few years we spent most of our time keeping everyone alive – five is a fair number of kids. After being relatively satisfied with the result of that, we decided to tackle a few DIY projects. Since then, little by little, we’ve been making this home truly our own! I hope you’ll stay and look around. You might enjoy a few details about our home, or if you fancy, please check out the myriad of projects in the project library. 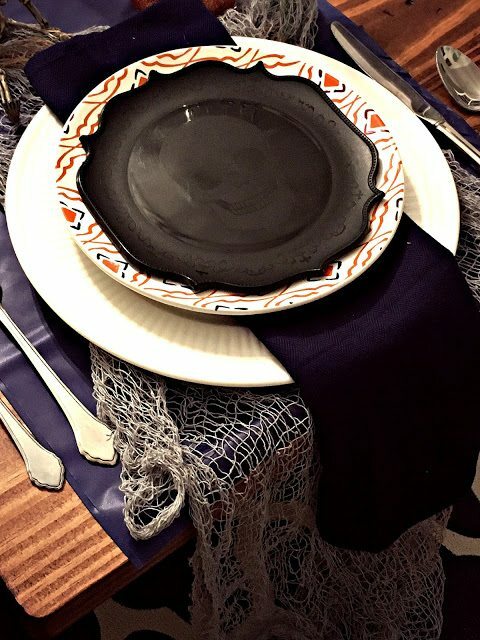 For now, though, let’s get ready to dine with spooky, yet untraditional style! Be careful, though, to watch out for the scary creatures that may be creeping around on the table. Shh.. Let’s tread softly lest we wake them from their naps! A near-black Dahlia sets the mood. There is such a wildness to Halloween that it is often necessary to have a centerpiece the same. I’ll be sharing the details on this fun DIY centerpiece next week! My table setting is a casual one which makes non-ceramic plates totally acceptable! I picked these up in the Halloween section of Target. It’s easy enough to add whatever color you’d like to your Halloween decor. There is no rule saying you can only dress Halloween in orange and black. Thirsty? I’ve prepared a brew cocktail for you! Thanks so much for stopping by and I do hope you’ll do so again! Be sure to visit the other tablescapes on the hop! Wait! Before you go, enter your email address to subscribe for non-stop Knock it Off Kim fun! Kim, I bet you have a wicked sense of humor! What a way to end the Autumn Tablescape blog hop. Very creative Halloween table. I never would have thought of using your spooky things on a table, but it really works. Happy to be sharing the Autumn Tablescape Blog Hop with you. Kim I am loving your halloween table! That is a rockin good time for a spooky event. I am guessing your kids are loving the critters on the table and having fun with those. At least if my kids were young and saw this? They'd be having a ball. 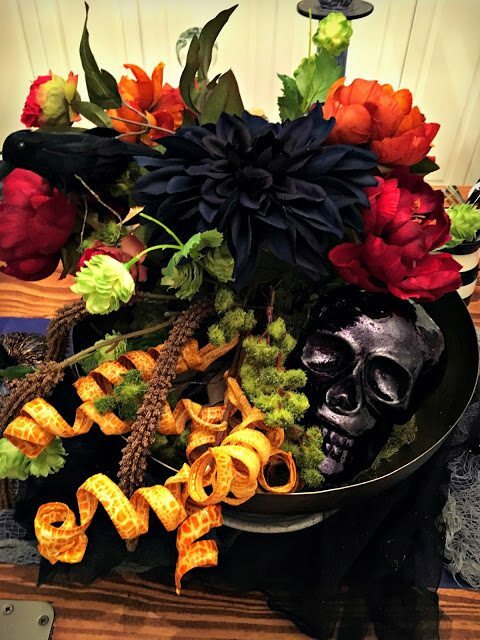 Oh Kim, before I begin my raves about your table, I have to say THANK YOU for doing a Halloween table! I was feeling very embarrassed and conspicuous for being the only one all week that did Halloween! All week there have been so many amazing, sophisticated, magazine worthy tables and right in the middle I throw in a crazy, kookie, silly witch post…and here I am at the very end of the hop and you save me from my loneliness! 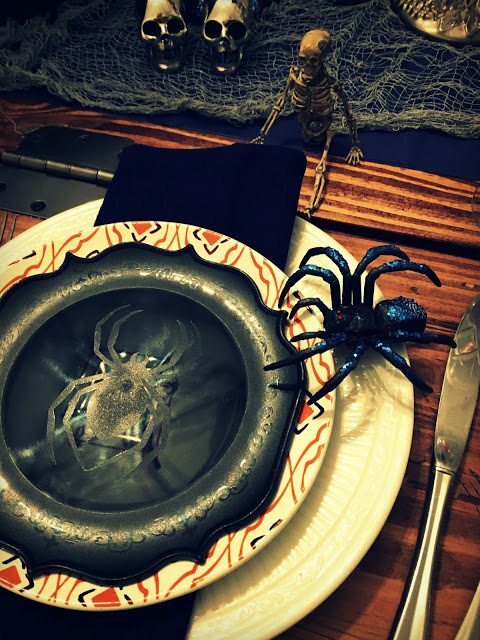 Your beautiful wood table looks fabulous covered with eerie spiders and snakes, potions and scary plates! I love the way you've woven the creepy netting down the center and under the plates, the candelabras, and the eyeballs in the goblets! Pure Halloween fun, I know your kids would gobble up anything if they got to sit there! Your centerpiece is frighteningly fabulous! Thanks for a great way to end the hop! Kim, what an awesome Halloween table. I love all of the drama and the detail. Your table is over the top with fun and creativity. 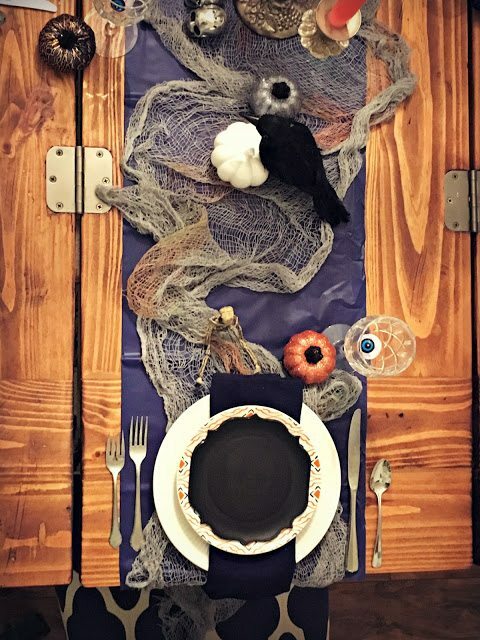 Your photo of your entire table really shows all of the eeriness (and hard work) to put together such an impressive and spooky table that both adults and children alike will absolutely adore! Kim, what a fabulous Halloween table! You are so talented and creative! You have perfectly thought of every detail! My kids would love this! I'm so happy that I was able to participate in the Fall Tablescape Blog Hop with such a talented group of girls! Happy Halloween! This table has me craving candy corn and chocolate! Great job on creating something spooky and a little creepy which is perfect for the holiday. 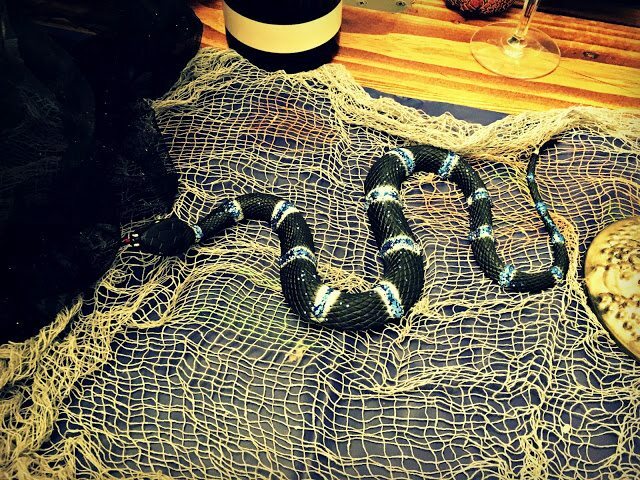 That snake on the table better not crawl onto my plate! Your cute tablescape would go flying across the room! Haha! Such a fun and festive table! It's been a great week of blog hopping, don't you think?! What a fun way to celebrate Halloween! I love the way you put together all these whimsical holiday items and yet set them in a classic table setting! Love the table runner! I love love love it!!! Those plates are amazing and I'm still drooling over that dining room redo. Nice work! Kim, this is outrageously fun! I bet your kids loved this, not mention us adults! That centerpiece is fantastic. A really fun and unique tablescape. Kudos! What a great table set for Halloween! 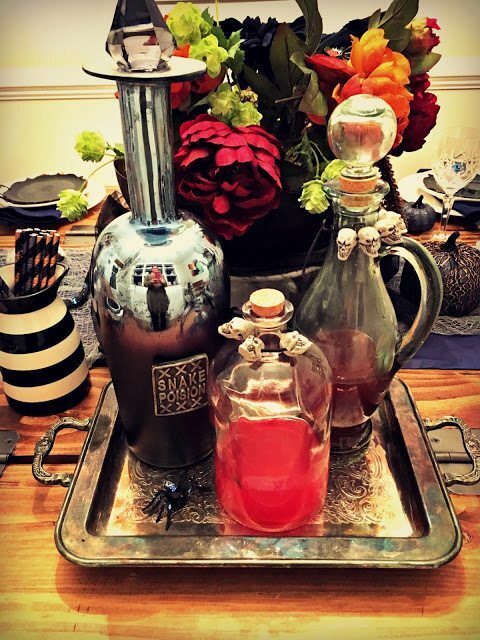 I imagine friends and family having a delightfully spooky time when sitting down to your table with the creepy critters and the potion bottles! 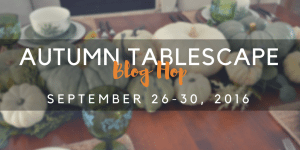 Thank you so much for being part of the Autumn Tablescape Blog Hop! I am so excited to see another Halloween table! This one has whimsy and also a bit of dark side; perfect combination. What a way to end this series! This is such a great tablescape! I love all of the details of this, so many creative ideas! Fun for a spooky Halloween party! Dahlias are my favourite, so I actually "Ooooh"ed out loud when I saw that black one! 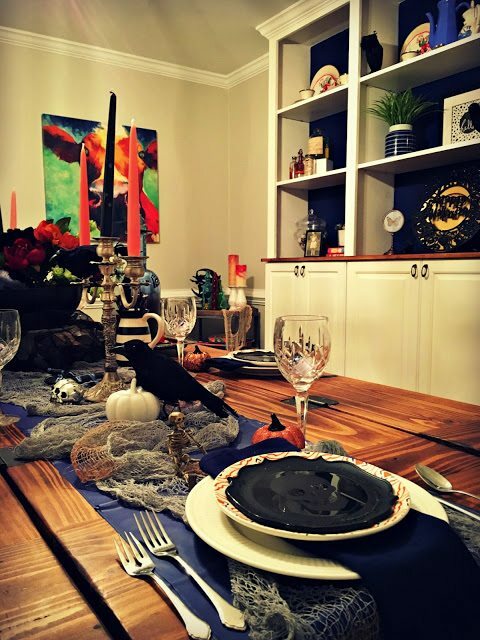 Your table is the perfect blend of spooky and elegant. 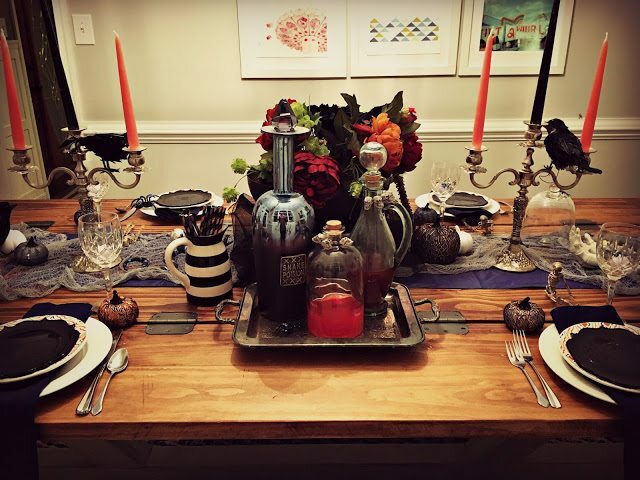 I love all things Halloween and this is such a fun tablescape! You did not leave out any detail! This is so creepy and fun! That candelabra is fabulous and those plates! Love the tray of potions.